When considering body positioning there are many structural things one has to take into account. Our teachers continually speak about this framework in our bodies and it is up to us to not just grasp the concepts, but to be able to plot and create a living framework that use these concepts in our martial arts practice and application. This is more easily said than done. While we might understand these ideas cerebrally, most need only to look in a mirror when they practice, to see that my physical body has not yet manifested them. It seems that our intention does not match with our physical practice easily. To assist with bridging this gap, I would like to present a ‘roadmap/blueprint’ to help point out the mental framework of Chang Hong internal body structure. As far as actually attaining the skills, well that’s time we will need to spend practicing and refining. No shortcuts there! A good starting point is the lower Dantian. This idea is especially important and is referenced very often in Wushu practice. It is a central concept to the physical and mental methods found in both Wushu and Qigong. 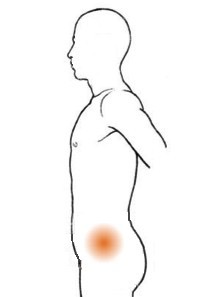 The lower Dantian is located in the lower abdomen a few inches below the navel and in the middle of the body. The lower Dantian is not like an internal organ, in that it is not a physical thing. It is a feeling that becomes more tangible through continued practice. The Dantian becomes a focal point and is achieved through sensory training e.g. standing qigong like Dantian Hu Xi. 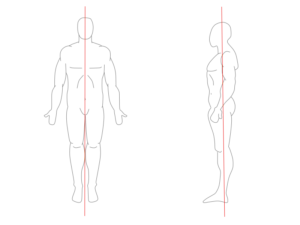 The Dantian is also the body’s centre of gravity or Zhong Xin when standing upright and marks the intersection of both the Vertical Central Axis and the Centre line (Horizontal Axis). One of the main goals of Dantian is to control the force throughout the body. All trajectories of force must come from the lower Dantian and return back to it. Hence it is also the major focus point for stability. Developing our Dantian is of primary importance for effective Wushu usage. Actually, in our bodies we have Three Dantians, known as the lower, middle and upper Dantians respectively. 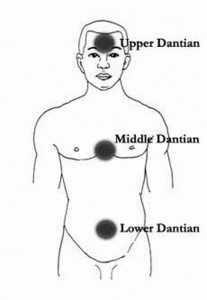 The alignment of the Dantians in body structure is important but the lower Dantian plays the biggest role. The next structural element to explore is the Central Axis or Vertical Centre Line. This is a line that dissects our body in half down the middle. 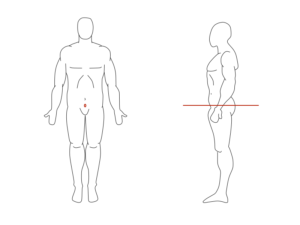 The Central Axis is a continuous line that extends into infinity through the body and does not stop at the top of the head or the bottom of the feet. 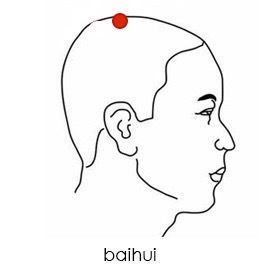 The Central Axis intersects directly through Baihui, our 3 Dantians and Huiyin. We rotate our bodies on this axis and must learn to stay upright, raising our force from the lower Dantian. It is important to rotate from the Dantian and not from the extremities of our bodies i.e. shoulders, arms, legs, neck and head. Shuai Yao is the basic exercise which we can use to learn to rotate on the central axis. Next we can look at the Centre Line or Horizontal Axis. 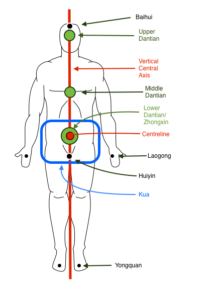 This is a line that cuts through the body on a horizontal plane and intersects the Central Axis at the height of the lower Dantian. This line also continues into infinity and is not bound by the width or shape of the body. This line is also the line we use to find our opponents Dantian and to “connect” with them to help better judge, see and manipulate their body structure in relation to ours. Let us look at the theories of the Three Sections and the Nine Joints. These form the basis of the central concepts of Chang Hong Wushu and are a major focus of learning. The three main sections of the body refer to: 1) Legs, 2) Torso and 3) Arms. 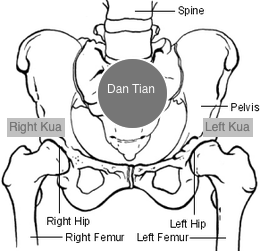 Legs: Ankle, Knee and Hip (Kua). Torso: Waist, Ribs and Neck. Arms: Shoulder, Elbow and Wrist. Since these are quite physical things that we are very familiar with in our everyday life, they do not require a diagram to illustrate. However, it is worth looking more closely at one of the leg joints in detail. This joint is the Hips or Kua. 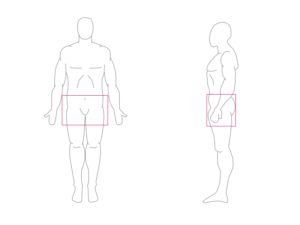 The Kua is actually not just the hips, it refers to the inguinal area i.e the creases at the junction of the thighs and torso. This also includes the Psoas muscles which connect to the hips. The Kua can be broken into three main sections. The Left Kua, the Right Kua and the lower Dan Tian. Since the Kua also houses the lower Dantian, it is a very important section of the body and much time must be taken to learn, understand and utilise all it’s different movements. The basic moves of Xia Dun, Shuai Yao, Huo Yao and Tuo Tian Hua Di all initiate from the Kua and help us to understand the relationship of Kua and Dantian. Two more important points worth mentioning are the Laogong and Yongquan points. Although these two points are not necessarily about body structure they do help to maintain and create the correct structures for enhanced force delivery and controlling Qi. 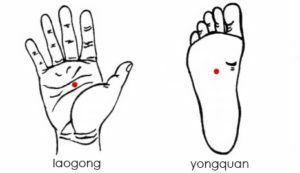 Laogong is the centre of the palm and in Hong Quan emphasis is given to focusing intention into the centre of the palm as well as to keep the palms con-caved in. Yongquan is important as it is the place that we centre our weight on. By putting all these all ideas together we can start to create a mental framework. The diagram below shows a two dimensional model of the basic Chang Hong internal body structure. My aim with creating this visual model is to help all kinds of students get a working concept of the internal Chang Hong Wushu structures relatively quickly. A much better way to demonstrate it all, would be to use a 3D interactive model. And so, that’s exactly what I have created; an easy to use/access 3D interactive model. After all, a picture paints a thousand words. You can now see this model in three dimensions (3D) using Augmented Reality technology. You will need a ANDROID mobile/tablet phone to do this. Please follow the instructions below. Print a copy of the specially created TrackPad. Please print it on an A4 sheet. Lay the printed TrackPad out on a flat surface. Once downloaded, open the ChangHong application on your mobile/tablet and simply point your camera at the TrackPad. Move your mobile/tablet around and explore the Chang Hong Wushu internal body structures. You can move the mobile or the TrackPad to examine the 3D model. Hopefully coaches around the world can see value in this model and it can be further refined and used as a teaching aid for students so that they can better understand the Chang Hong concepts and build a stronger foundation for deeper training. Simply knowing about these points and sections is not enough to have competent Wushu skill. Chang Hong methodology requires that the student must add to the above with the learning and exploration of Kai/He i.e opening and closing of joints, inner space, intention, situation, Yin and Yang pathways, as well as circular rotation and the continual recycling of force. There is also the the very important topic and field of study; Qigong. Only once a student has started on the path to understanding all these facets, can one say that the Chang Hong principles are in play. Hence we can see that the study of Chang Hong Wushu is both deep and profound.